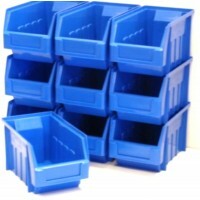 Excellent quality plastic bin parts to fit and use with louvre panels. We stock different quantities, colours and sizes to suit all workspace areas. 10 Storage Bins Medium Size 2 Excellent Quality Bins will fit louvre Panel or Stack as required ..
10 Storage Bins LARGE Size 3 Excellent Quality Bins will fit louvre Panel or Stack as required .. 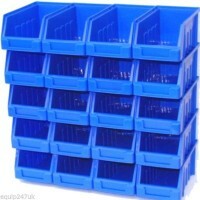 Excellent Quality Bins will fit louvre Panel or Stack as required Strong Rear Lip for use with Lo..
TOOL SHELF STORAGE SYSTEM Pack of 10 The tool tray is IDEAL for holding everyday tools l..
10 SIZE 1 YELLOW PARTS STORAGE STACKING BIN BINS BOX EXTERNAL DIMENSIONS: 125mm LONG X 100mm WIDE..
10 YELLOW Storage Bins Large Size 5 These are a Large And A Good size for a variety of uses Ex..
10 Storage Bins Large Size 5 PLUS 20 FREE DIVIDERS 2 FOR EACH BIN Bins can be divided into 2 or 3..
10 Storage Bins Large Size 4 Excellent Quality Bins will fit louvre Panel or Stack as required ..
10 Storage Bins Large Size 5 These are a Large And A Good size for a variety of uses Excellent..
10 Storage Bins Extra Large Size 7 These are Brand New Extra Large Extra Tough Bins A Good ..
10 Excellent Quality Bins will fit louvre Panel or Stack as required Strong Rear Lip for use with..
10 YELLOW STORAGE BINS LARGE 290mmLx363mm PLUS 20 FREE DIVIDERS 2 FOR EACH BIN Bins can be ..
100 Storage Bins LARGE Size 3 Excellent Quality Bins will fit louvre Panel or Stack as required ..